Eric Flett was born in Ste Rose du Lac, Manitoba, about 15 minutes from where he lived, the Ebb and Flow First Nation. Eric lived there with his parents and nine siblings until he was about four years old, when his family moved to Winnipeg. He said it wasn’t easy adjusting from reserve life to city life in the North End. But thanks to his mother’s strict parenting, Eric stayed on the straight and narrow, maintained a childhood free from bad influences and graduated from Sisler High School in 1986. Eric attended his first ceremonial sweat lodge when he was 14. A sweat lodge is traditionally a place where prayer and song ceremonies are performed, so that we can be cleansed. However, it wasn’t until he was around 20 years of age that his interest and understanding were truly formed, and from that point on he has been continually active in ceremonies and traditions. When Eric took part in the Sun Dance Ceremony, his niece was very sick and he wanted to dance for her. This ceremony usually involves the community gathering together to pray for healing. Individuals make personal sacrifices on behalf of a loved one or the community. From here, Eric continued to participate in his culture’s activities and received training from his Elders. Today Eric plays a leadership role in the community, a role that is entrusted to those who earned the rights and training to lead a sweat lodge and other ceremonies. These earned rights are what help Eric succeed in his day-to-day life as well as work. Eric became a UFCW Local 832 member in 1990, when he was hired as a healthcare aide at the St. Boniface Hospital. 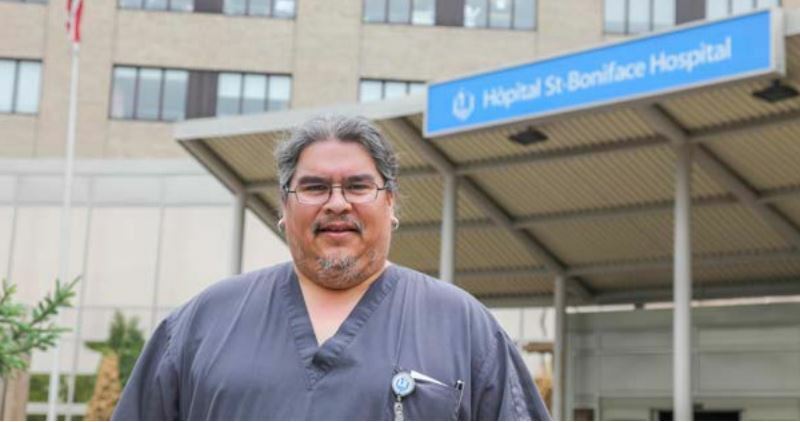 He thought this was a perfect fit, as he loves helping people and refers to himself in his Ojibwa language as “helper.” Today, he works as a porter in the diagnostic imaging department, still helping people. His involvement with the union began about 10 years ago when he was elected to the audit committee of UFCW, which continues today. Besides his porter position, Eric is also a shop steward and sits on Local 832’s executive board. On his off days, Eric enjoys watching TV, golfing and continuing to practice his culture.